Are you looking to increase the international reach of your business? Want to know how a single social media network can help you do that? Consider Instagram. Imagine a single app that gives access to the opinions, thoughts, and feelings of your customers and potential customers from opposite points of the globe. Imagine sharing your experiences and new products with an audience that is truly engaged with what you have to say. That’s the potential of Instagram. Instagram has more than 500 million followers worldwide (NetImperative). With more users than Twitter, there’s a clear rationale for using this rapidly growing social network. Whilst Instagram is very popular, this does not necessarily equal success. Success on Instagram is determined by a smart strategy that is underlined by a clear rationale for using the network. In this article, I provide guidance on whether incorporating Instagram into your social media marketing is a smart strategy for your business, and how you can leverage the network for reaching international markets. Should you invest time, energy and resources to grow a strong Instagram presence? The answer: it depends. You have limited resources. So, you need to optimize where you spend time. The key question is: is Instagram right for your brand? You should take time to consider which social media platforms are most relevant to your brand and to your audience (The Global Marketing Alliance). Let’s consider these aspects now. Who are you targeting? This is a very important factor in deciding whether to invest in any social media network. If your target audience isn’t using the network, there’s not much point of having a presence there. Instagram is hugely popular with millennials, with 90% of Instagram users under 35 (Science Daily). So, you should assess the demographic profile of your audience when deciding if to use Instagram. You should also consider the geographical location of your target market. The greatest share of traffic to Instagram comes from the US, followed by Russia and Brazil. Still, over 80% of Instagram users are outside the US (Instagram). 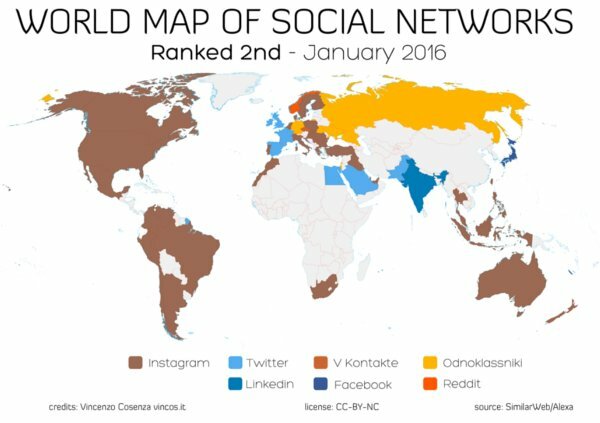 Instagram is the second most popular social network in 41 countries, having recently conquered Argentina, Canada, Denmark, Philippines, Qatar, Switzerland, Taiwan, UAE (Vincenzo Cosenza). 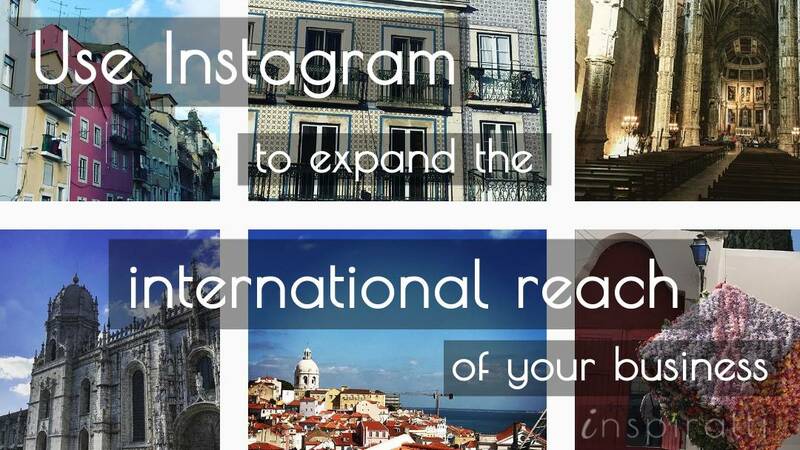 So, Instagram is a good bet if you are looking for a large and diverse international reach. Instagram is the most popular network in America and Australasia. You should also think about the nature of your product and/or industry. Travel, fashion and food brands perform especially well on Instagram. They have huge streams of beautiful visual content perfect for sharing on the network. Does that mean a service brand cannot succeed on the network? Not necessarily. Consider consulting. It doesn’t strike you as the most visual of industries. Yet many professionals have excelled at developing strong followings around tight-knit niches built around their consulting services. Without a physical product or stunning visuals to hand, they have found creative ways to make the abstract visual. Digital magazine, Foundr, uses Instagram to provide inspiration for entrepreneurs through success stories, interviews, and motivational quotes. In sum, the question of whether to invest in Instagram is not so much dependent upon which industry you in and which region you are targeting. Rather, it ultimately depends upon whether you can carve out a unique visual identity on the network that resonates with your target audience. Once you have identified that your target market is using Instagram, you need to know how you will get their attention. On Instagram, some things have universal appeal and resonance. Other things only resonate with a very specific local audience, say a one small town and that’s it. You need to find the right balance between these global-local aspects. With that in mind, let’s explore these global trends and hyper-local preferences. And how we can capitalize on them. Takeaway: Keep it simple. Use natural looking photos that show a more authentic representation of your brand. The visual impact of a photo using a great filter can command a lot of attention. And it can have a big impact on success of your post. Is it possible to use a filter that will be well liked globally? A study by Canva indicates “Yes!”. 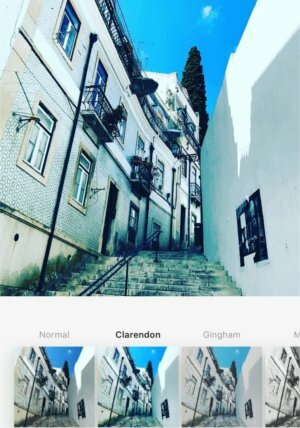 They found that Instagram users in 119 countries use ‘Clarendon’ to filter most of their photos. This covers practically all North and South America, Europe, Russia, Asia, Australia, and much of Africa. But wait..
Filter preferences do vary by country and even region. Canva found differences in the second and third most used Instagram filters by country and even within different regions of the USA. Filter preferences also vary by the type of pictures you are posting. This makes sense when you think about it. People taking photos of the natural environment want to show it as it is. That explains why ‘no filter’ was the second most popular for nature photos. Adding a filter dilutes the natural beauty. Meanwhile, ‘Kelvin’ is most popular with fashionistas for the retro effect that it creates (Canva). Takeaway: ‘Clarendon’ is the safest bet to reach a global audience, but examine local filter preferences if you are targeting a specific region. Take care to use the best filter for images in your Instagram posts. Using a trending hashtag is a good way to increase your brands visibility on the network. Using hashtags makes your brand searchable for specific keywords on social media (Yesgram). But to be noticed by your target audience, you need to be using the right hashtags. For example, popular hashtags on Instagram for fashionistas include: #fashion, #style, #instafashion, #fashionista. These hashtags are popular with fashion fans all over the world. However, the most important local hashtags vary between countries. This is especially prominent in Europe, where the huge diversity of languages promotes foreign language hashtags only used by speakers of the language. Whilst some hashtags are country specific, others are popular in several different countries. 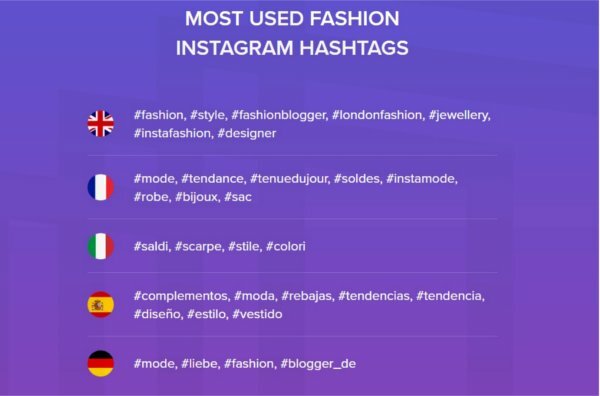 The most used fashion hashtags in the UK, France, Italy, Spain and Germany. Takeaway: You can use up to 30 hashtags in your Instagram posts. Avoid generic hashtags. Instead, research universal hashtags popular in your niche. Also investigate hashtags relevant to the specific geographic region you are targeting. Try to strike a balance between universal and local hashtags in your posts. As people scroll through their Instagram feed, a well-placed emoji can make people stop and take notice. In fact, almost 50 percent of all captions and comments on Instagram have at least one emoji (Sprout Social). Emojis also make you more searchable, as they can be searched on Instagram as both a hashtag and in your user name (Social Media Examiner). Yet use of emojis is higher in some in some countries than others. People in Finland use emojis the most frequently, with 63 percent of all posts from the country containing at least one graphic. This is followed by the US, France, the UK and Germany (Engadget). Are you targeting countries where people heavily value emojis? Whilst many emojis are well-used globally, popularity of different emojis also varies by location. In fact, usage often varies within the same country. One study showed the huge variance in popularity of different travel-related emoji across different US states (Malay Mail Online). Takeaway: Use Emojis to add feeling to your posts 🙂 But don’t overuse them. Discover local emojis to reach specific local audiences. You can draw general trends and observations, both globally and locally. But should you apply them? Not necessarily. Yes, you do need to be relevant to the region that you are targeting. More importantly, though, you need to be relevant and interesting to the niche community you are trying to target. Perform a test: Set out a 3-week period, and post different types of images during that time. Then assess how they perform: which images get the most likes and comments, and which images get a lot of tagging? And what doesn’t? You’ll probably find certain types of images perform well. After drawing out some key trends, you’ll be in a strong position to create more of the images that people like. Use these insights to optimize your content and continue to iterate to improve performance over time. Once you are successfully getting the attention of your target audience, you need to retain their attention. For that, you need to build a loyal community of dedicated followers. How to do that effectively is the topic for my next post. Are you using Instagram in your business? What tactics do you use to get the attention of your target audience?